Welcome to my sculpture site. My name is Sylvia Verhoeven. Born in Scheveningen, I now live and work in The Hague. My first artistic endeavours were with abstract painting, which I did with great satisfaction for several years until I came across sculpting in stone. For me, therein lies the ultimate experience, with always a profound discovery of understanding the stone to the final result, the image. For several years I have been working as a freelance sculptor, in both figurative and abstract shapes. How does this work? My sculptures are created in my imagination, which gets free reign. So comes the stone to life for me to express my feelings. This allows each stone and each sculpture to have its own character, my signature. In addition, I always like it when people put their own interpretations to my works. The stone begins its final journey ending in the image that is created out of love for the shape that it takes underway. The search for space and the abandonment of the fixed structure in it is what I seek to create. My perception. 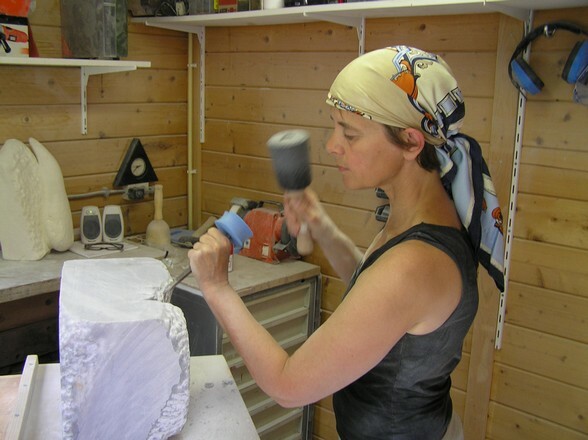 Working and creating an image in hard stone, is working against pure resistance, a challenge that I undertake out of love and passion for sculpting. This applies to all rocks where each "chip" is irreversible. All sculptures are for sale. Of course you can first view without any obligation. You can do this via the "Contact" link in the left menu or make an appointment by e-mail (Beelden@sylvia-verhoeven.nl). You are welcome! A sculpture located in the right place and with the right lighting, is a source of energy every day.